* Does what a mouthwash is supposed to be. Good for us. * Pleasant taste. General consensus: “I like the taste. I love the results." * Simply swish about a capful of the freshener into the mouth for 15-30 seconds and spit out. Do not swallow. Shake before using. * Can be used after cleaning and flossing. Can also be used alone. * It is best to clean and floss with Tooth Cleanser at night and in morning. If you do not have time in the morning to do a proper cleaning job, the mouth freshener does provide cleansing properties. * Do not expect the WOW feel of common mouthwashes. Natural ones cannot do that. But do expect a fresh feeling and good results. * Bathroom storage is fine, but use within several months of purchase or keep in fridge. Cinnamon (Cinnamomum verum) The oill is distilled from the leaf of the cinnamon tree itself and has been used as a cleansing agent due to its high anti microbial and anti bacterial properties. Spearmint (mentha viridis) has a tingling, cooling, refreshing feeling. It is loaded with vitamins, antioxidants and other vital nutrients. Lemon (melissa officinalis) has a clean, refreshing and uplifting scent. Lemon naturally purifies and cleans. Myrrh (commiphora myrrha) is widely considered to be one of the most effective substances for maintaining gum health. 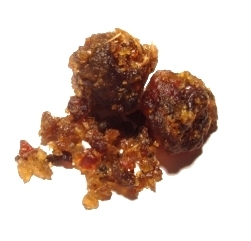 As the pure essential oil cannot mix with water, a myrrh extract was selected for our mouth freshener as it is an excellent fighter against bacteria and bad breath. Chlorophyll (chlorophyll) is a green pigment (magnesium) found in most plants. It is non-irritating, gentle and totally non-toxic. Chlorophyll has an antibacterial cleansing action and is known to remove unpleasant odors. Lemonseed Extract (citrus medica limonum) is a bio-citrus extract used as our natural preservative. Organic and eco certified. I had an awful canker sore in my mouth for a quite a few days I used the mouth freshener and it was healed in two days. The unique flavour took a bit getting used too and now I love it! I swear by the freshener for overall mouth/gum health and I have not had a canker sore since I use it daily.